The Royals slogan this year is “It All Happens Here” at Kauffman Stadium in 2010. They’ve got a great list of items they are giving away this summer including powder blue jerseys that first week of the season and a Zack Greinke bobblehead. OK, gotta be honest…never really saw the thrill in the bobble heads…They remind me of Precious Moments figures for sports fans. Royals Blue Replica Jersey: Fans can gear up for the 2010 season in style by getting a Royals Blue Replica Jersey on Saturday, April 10. The jerseys, presented by Fox Sports Kansas City, will be given away to the first 20,000 fans. 25th Anniversary of the 1985 World Series: The Royals will commemorate the 25th Anniversary of its historic World Series victory with a month-long series of special events and promotions. The celebration begins with the second annual Willie Wilson Classic presented by Willie Wilson Baseball and Farmland Foods on Saturday, May 22. The Classic will feature the 1985 World Series Royals Alumni in a softball game against members of the 1985 St. Louis Cardinals prior to the Royals-Rockies 3:10 p.m. matchup. Promotions will also include a 1985 25th Anniversary T-Shirt presented by AT&T, a Bret Saberhagen bobblehead, a Build-A-(Polar) Bear and a Salute to the 1985 World Series. Greinke Bobblehead: The Royals salute the reigning American League Cy Young Award winner by honoring him in bobblehead form. 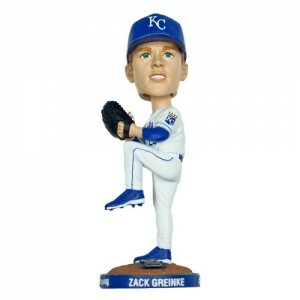 A Zack Greinke Bobblehead presented by Sprint will be given to the first 20,000 fans on Saturday, April 24 as the Royals take on the Minnesota Twins.